The 5553 series are UL listed fire alarm speakers suitable for Division 2 hazardous locations, and can be installed indoors or outdoors. 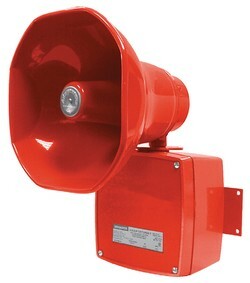 They comply with UL 1480, Fire Protective Signaling Speakers standard. The speakers are available in red or grey, and include a blocking capacitor for use on supervised circuits. -UL listed for Class I, Div. 2, Groups A, B, C, and D; Class II, Div. 2, Groups F and G; Class III, Div. 1 and 2.